“They gave us a blow, but now we are here to seek justice,” Juan Vázquez Luna, a member of Civil Society Las Abejas of Acteal, said at the hearing before the Inter-American Commission on Human Rights (IACHR), in Washington DC, to demand justice for the massacre perpetrated against 18 adult women, 4 of them pregnant; 16 adolescents; 4 children and 7 men, on December 22, 1997, 6,512 days ago, in Acteal community, Chenalhó municipality, Chiapas. Vázquez Luna, a member of the Board of Directors of Las Abejas, who lost nine of his relatives in the massacre, presented a study to the IACHR about the Acteal Massacre, titled: Psychosocial Study of the background, factors associated with the act and management of the emergency, psychosocial consequences and the collective impact on the Acteal community. “Said psychosocial study includes a Forensic Medical Expert Report,” he added. 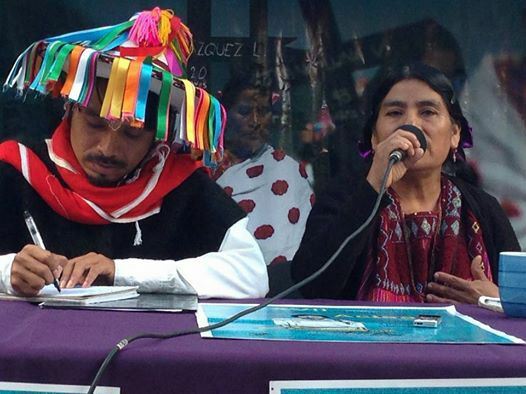 “The Mexican State planned this massacre,” the indigenous of Los Altos of Chiapas assured in the voice of Vázquez Luna, and therefore they asked the IACHR: “that it emit an in depth report about the Acteal Massacre Case, declaring the State responsible for the violations.” The Fray Bartolomé de las Casas Human Rights Center (Frayba) accompanied Las Abejas de Acteal), as it has done since December 1997. “The Mexican State continues promoting impunity through its corrupt system,” evidenced Civil Society Las Abejas, upon pointing out that: “Far from punishing those responsible for the massacre, they have rewarded them with lands, homes and even monthly pensions.” “Those directly responsible for the Acteal Massacre have been liberated,” they affirmed. For his part Commissioner Ortiz questioned representatives of the Mexican government: “what basis did the Attorney General of the Republic (PGR) have for concluding that the Acteal Massacre was not perpetrated by paramilitaries.” “If the State said that the site of the Acteal Massacre was not preserved, then how can it draw trustworthy conclusions,” the human rights defender asked. In his participation at the IACHR hearing, the Mexican government’s envoy, Roberto Campa Cifrián, recognized that faced with the massacre in the community of Acteal, the State “was incapable of preventing these acts and of responding adequately afterwards.” Despite everything, “The Mexican State denies the internal armed conflict and the low-intensity war that prevail in Chiapas,” the Frayba pointed out. “Impunity is part of the counterinsurgency strategy because it wears out and divides the survivors, and that has brought us grave pain. The Mexican State’s policy of integral wear and tear is its weapon for killing our memory, for leaving its crime unpunished,” the indigenous in resistance also expressed in an October 2 communiqué. After the hearing at the IACHR in Washington, the Civil Society Las Abejas of Acteal organization held a press conference in San Cristóbal de las Casas, Chiapas. “The impact of the Acteal Massacre is manifested by chronic stress, an absence of justice and wear and tear on the community,” the Indigenous Tsotsils shared, in the Frayba installations. “The majority of those who died in Acteal were women,” emphasized María Vásquez, a survivor of the massacre. “The Mexican government wanted to exterminate us, but we’re here continuing to denounce this State crime,” the indigenous Tsotsil emphasized. “Two years and nine months after the presentation of observations on the Background on the Acteal Massacre Case (January 30, 2013), the petitioners have not received the Mexican State’s alleged observations,” the Frayba said. “Because of what was said earlier in this hearing, we have asked the IACHR Commissioners to insist that the Mexican State present corresponding observations and that the IACHR emit the Background Report with respect to this case,” the human rights organism added. “The counterinsurgency stage, during the government of Ernesto Zedillo, consisted in undermine the civilian population’s support for the guerrilla, in the Highlands (Altos) and the Northern zones with police and paramilitary actions, under the command of the Mexican Army and its Rainbow Task Force, commanded by General Mario Renán Castillo,” the Frayba remembered. “This strategy was revealed in the document “Chiapas 94 Campaign Plan,” its representative expanded.